There are no log book records available for the school. 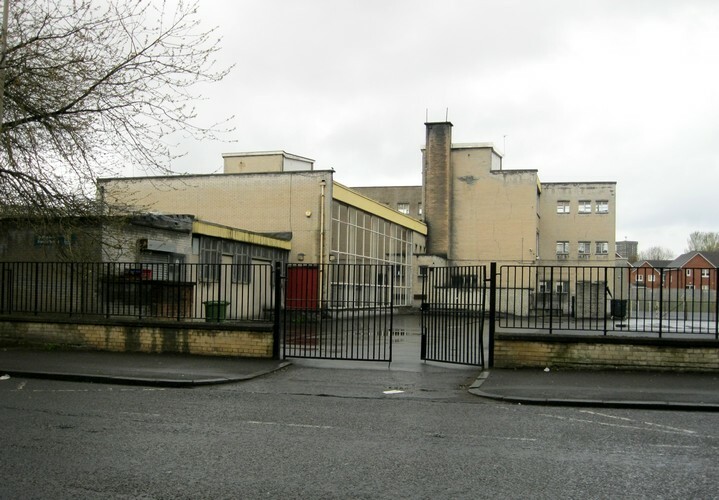 The school first appears in the Glasgow Directories in 1901-1902 and was located in Nisbet Street, Parkhead. The school was transferred to the Education Authority in 1918 and the following records show the progression through the years. In 1933 the school is shown as having an annexe in Elba Lane which was on the south side of the Gallowgate approximately where the present St. Michael’s Church stands. The school appears to have been in existence in Nisbet Street since 1901-1902 through to 1960-1961 and in 1961-1962 was in Elba Lane before moving to 865 Springfield Road in 1962-1963. Further information, as and when obtained will be posted. Address Nisbet Street, Parkhead E.1. Annexe (Parkhead R.C. School) Elba lane, Parkhead E. 1. Address Elba Lane, Parkhead E.1. Some exhausted Parkhead folk, going away on holiday this week-end, intend when they return to use some of their new energy to secure a much needed school for the young Catholic children of the district. They will need every ounce of that energy, as the Standard has been informed that one of the persons in intimate touch with the negotiations has stated that it will be about eight years before the school is built if the progress continues to be as slow as at present! If this statement is true, it seems as if the Corporation and Education authorities are playing a double game with the St Michael’s people, as it is eight years ago since a promise was made to provide a fine modern school for the district. An ironic touch is that at that date the Education Committee secured a three-years lease of ground belonging to St. Michael’s and erected a “temporary” school upon it! Parents of the scholars are anxious at the position in which they find themselves, some having to see their children to three different schools. The infants they take to the “ temporary” school in Elba Lane, Gallowgate, then the slightly older ones are convoyed to the Nisbet Street School, and those past the qualifying stage attend the advanced school of St. Mark’s. Even the parishioners who have no children at school are affected, as they wish to build a new church but are prevented as the school occupies part of the ground that would be required. It is generally admitted that the need for a new church is very great, as the present building is not in very good repair. This is particularly noticeable on the roof and floor. On three occasions recently the roof has had to be repaired. The building itself holds 400, with some judicious seating, and is hopelessly inadequate for the number attending the various services. The situation has its silver lining,as the Standard is informed that actually plans for the school and church are prepared. All that is needed is something to accelerate the slow movements of officialdom. The prospective school is to accommodate about 1000 scholars while the church will have seating for 1400 worshippers. Another name adds itself to the list of headmasters of the old brigade, who have retired from active service, Mr John Donaghy, headmaster of St Michaels Catholic School Parkhead, was the guest of honour at a social gathering held in the Grosvenor Restaurant last week at which he received a presentation from the teaching staff. The chair was occupied by the Rev, Dr Laydon who paid adequate testimony to the character and merits of the retiring headmaster. He spoke deeply and truly of Mr. Donaghy’s work as he saw it during seven years of friendship. In a reminiscent not he remarked that when Mr Donaghy’s predecessor, Miss Flanagan, a gem of a woman and an exemplary headmistress for many years retired he wondered where a worthy successor could be found. He was thankful that an eminent and worthy successor followed who kept up the traditions in a way that reflected the greatest credit on a catholic teacher. Mr. Donaghy was neither a 9 to 4 man nor a Friday afternoon man but worked conscientiously throughout the week and over the weekend, attending to the educational and spiritual needs of the children of the parish. Miss Fisher the first assistant, made the presentation on behalf of the staff. She endorsed all that Dr Laydon had said. Mr.Donaghys second love was music, and she therefore asked him to accept the bound volumes of music and an inlaid music cabinet with the best wishes of all present. Mr Doneghy, who was at one time a popular figure on the concert platform under the name Foley Banks, recalled his young days as a teacher his days at St John’s and later in London when the teacher’s lot consisted of hard work and low earnings. Those were the days of struggle and study, with the responsibility of large classes and hard rigid yearly examinations. It was a Spartan pruning that brought forth abundant fruit. Rev, Fr, Daniel, of St Michael’s himself the son of another headmaster of the old brigade, testified to the worthy and efficient of Mr. Doneghy . Then Mr.William Cudahy, F.E.I S, a lifelong friend of Mr. Doneghy, contributed his eloquent tribute to a loyal, honorable man. Miss Henretty, the infant mistress proposed a vote of thanks to the chairman, Rev. Dr. Laydon, and referred to his deep personal interest in the teachers, the school, and everything concerned with education in the parish. The teachers found in him a real friend, in whose understanding they could confide, and whose opinion they always valued for it justice and sincerity. I attended St Michaels from 1973 to 1975 (5-7years) before we emigrated to NZ. My teacher was Miss Carroll. Hi I went to Elba Lane and moved round to the Springfield Road building when I was 7 . That was in 67 my teachers at both schools where Miss Cambridge . miss Duffy (loved her and she had a twin sister who was also a teacher but at another school ) then Mrs Dixon . The head master was Mr Ward . We lived in Salamanca St . I remember the church before the new one was built . Had lots of friends who lived in our street Kelly’s O’Neils Rice Homes . I loved St Michaels We moved to ben closer to our grandparents in Cambuslang . My brother just loved Miss Carroll too. I too went to this primary, Mr ward was the head master but cant really remember the other teachers. Anyone know if any photos of this era have been kept ? was at this school in 1970s- a dump and teachers were rotten-even fat b-stard janitor bell , no good memories of this east end hovel !! I remember attending Elba Lane and then moving to the new school in Springfield Road. I went to St Michaels, Elba Lane aged 5 in 1953, over to Annexe Building in Salamanca Street, and on to main school building next to Chapel. Only remember my teacher, Miss Brogan, same age group as Miss McMillans class. I came from Dunbar Street, Harry Clark, and Eddie Hutchison from Salamanca Street was in my class, he was an altar boy, I tried but gave it up. A pretty girl, McFarlane, from corner close facing Eddie Hutchison was in our class too. Other names I recall were Cornelius O’Reilly, Harry McManus, Margaret Melly (married Jimmy Hutton), Frankie Chambers, John Lawrie, Jim Lamb, there were also people called Snodgrass and Rush at that time but maybe McMillans class. I remember my confirmation and first communion, the sash they put on us and badge they pinned on. Miss Brogan was a dreadful woman for hitting her pupils, with the strap and a wooden ruler on back of hand or head as she walked around giving dictation. Good news, therapy helped!!! Mr Kerr was a young teacher who came to the school and took our class for some sort of ‘technical’ learning; I recall building a church from cardboard during one of his classes. Boys in bottom playground, wee connecting gate into girls playground. 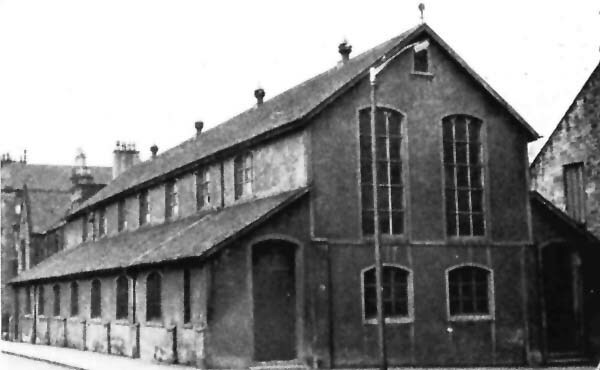 School dinners in Ravel Row, now Church Hall, Community Church in Westmuir Street. Boys Guild in Wyllies Hall every Thursday with Jimmy Feeley and Mr Sherry. That’s the brain shutting down now, ha ha, and back to therapy!!!! I went to St. Michaels school at the same time as Maria Duncan.Don’t know if you remember me, Maureen Gallagher? Was friendly with Patricia Porter and Cathy Mc Phee. Nice to reminisce. Also went to Our Lady and St. Francis. I remember Batman n Robin’s visit with the batmobile. My big sister Eileen a few years senior to me attended St Michael’s also. I remember Duffy the janny, Mrs Waters n im sure a Ms Magowan. I think Mr Flynn was Eileen’s teacher. I was also a pupil at the nursery at Elba Lane from 1954 to 1956 when I moved to Salamanca St. I can confirm Alice Andrew’s comments regarding the move to Springfield Rd. I was a pupil at that time and remember the move from Nesbitt St to Springfield Rd. Our Head Master was Mr Dawson and my teacher was Mr Flynn. I have our class photo which was taken just after we moved to Springfield Rd. Went to St Michaels at the same time as Maria Duncan. Don’t know if you remember me, Maureen Gallagher ? Went on to Our Lady and St Francis school.Was friendly with Patricia Porter and Cathy Mc Phee.Nice to remember the good times. St Michaels primary moved to Springfield Road on 23/11/1961. I can confirm this as I have the official school opening programme. My name was Aitken. Hi Alice…we’d love to have a copy of the programme for the site. We would love a copy of the programme and any other information or photos you may have. Hi I attended st Micheals from 1962 I was 7 went from Elba Lane into the big school St Micheals My Husband also went to St Micheals Frank O’donnell my maiden name was Hughes. We left 69-70 has any one rember the teachers at that time can any one rember Batman n Robin visiting Mr John Duffy was the Janitor .